Interested in seeing how FTIR and Raman can work for your application? Talk to an expert. Raman and FTIR spectroscopy are the perfect complement to one another for a wide variety of analyses. Where FTIR is strong at identifying functional groups, Raman spectroscopy is well-suited to giving information about molecular backbones. Additionally, molecular vibrations that are weak infrared absorbers are often strong Raman scatterers, and the opposite is also true. Having both techniques gives you the ability to analyze almost any sample, from polymers to gemstones and pharmaceuticals to forensics. Both infrared and Raman spectroscopy provide information about the molecular properties of a sample. A general rule of thumb is that weak IR absorbers are often strong Raman scatterers and vice versa. In Raman spectra, symmetric bonds are preferentially represented. Vibrations associated with the molecular backbone are emphasized, and vibrations associated with end groups are de-emphasized. In the infrared, bonds that are more active exhibit a large change in dipole moment as they undergo their vibration. The Raman active bonds are those in which a dipole change can be induced. 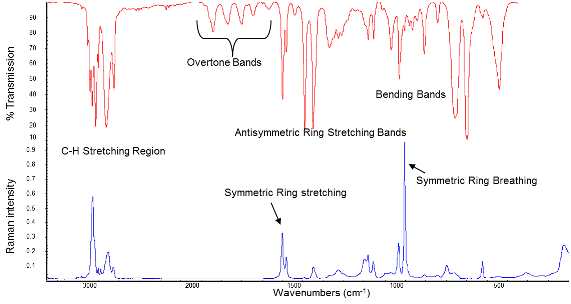 The spectra shown here are the FTIR and Raman spectra of polystyrene. In these two spectra, the vibrational modes associated with stretching, bending, and rocking motions are shown. This illustrates that more complete vibrational characterization is achievable by using both FTIR and Raman. See how Raman and FT-IR work to provide superior analysis with this conference poster.